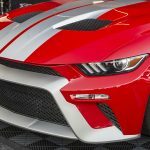 This 2017 Ford Mustang GTT was revealed at this year SEMA motor show and it presents a modern combination between the two most famous and successful Ford models, the Mustang and the GT. 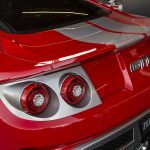 This original creation is designed and produced by Zero to 60 Designs, which presents a fully functional Gran Turismo Tribute vehicle. 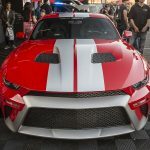 Which in fact, this is a road legal Mustang and it will be available from the next year for those who want to drive this unique piece of muscle car. 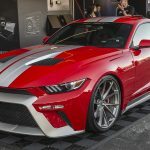 Zero to 60 Designs beside their unique design, have given to this GTT Mustang also a powerful Powertrain. 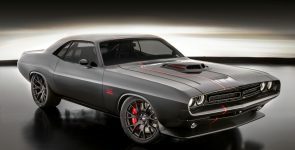 Under the hood there is a Supercharged Ford’s 302 cubic-inch, 5.0 liter small-block Coyote V8 engine, This Coyote V8 with the ProCharger produces 800 horsepower and 700 lb.-ft. of torque. For the management of the engine there is an ECU tune from SCT Performance. 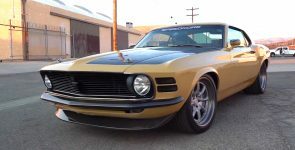 The Coyote engine has the Magnaflow dual exhaust system which provides a powerful sound and extra ponies. 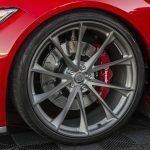 For better handling there is an Eibach Pro-Street-S suspension, which is connected with the 22-inch HRE Performance P204 wheels, equipped with Pirelli P-Zero tires. The outstanding braking performance, comes from the six-piston Brembo brakes, equipped with four vented rotors. 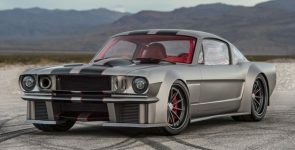 At the end, we must mention that the list of the equipment and the parts installed in this GTT Mustang is much larger, and for more info please visit Zero to 60 Designs.